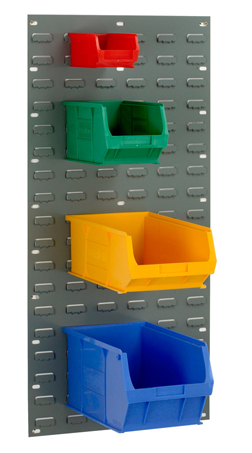 Wall rail bin set are easily fitted to walls. Louvre panels are used for the high density storage of parts bins and spigots. Steel panels are manufactured with rows of louvres that are used to locate the rear lip moulded into plastic picking bins enabling them to be hung on the storage panels. The louvre panels are available in a range of sizes and widths to allow fitting to walls, racks and trolleys. The steel panels are manufactured in both vertical and horizontal formats in a range of colours. 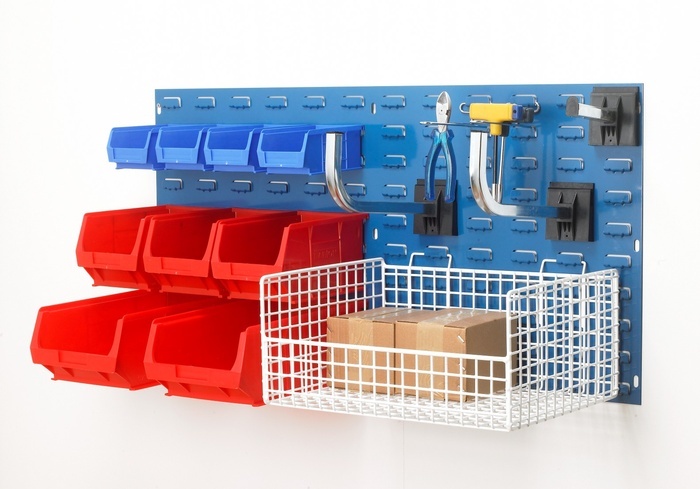 Parts bins of varying sizes can be easily located on these louvre panels saving wasted space and offering high density storage for items stored in the semi open fronted picking bins whilst allowing easy picking of component from the containers. We can also supply combination panels consisting of louvres for the storage of polypropylene plastic containers and perfo panels (perforated panels) for the storage of small hand tools. These metal louvre/perfo panels can be used for wall fixing or built into cabinets and cupboards for secure storage. Other containers & spigots for use with louvre panels.